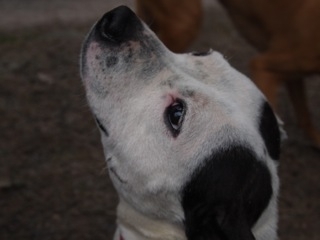 Nita fostered Staffie girl looking for her forever home. Nita is a Homeless Hounds dog and is in foster on the Lancs/West Yorks border between Burnley and Halifax. 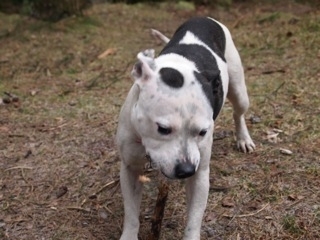 Nita is a young Staffie girl who is looking for her perfect home. She has been in a foster home for about 3 months now and from a very thin depressed little dog she has blossomed into a strong, fit and happy girl who is a pleasure to have around. She is house trained, is crate trained, halter trained, is fine around food, will not try to take other dogs food, has good recall off lead, does not run off, can be left alone for reasonable periods, is not destructive in a anyway, hardly barks and will settle down when asked. However we feel she would not be able to live with cats. In her foster home she lives with a male Weimaraner and female Vizsla and has been walked off lead with many different dogs, both large and small, as her foster carer is a professional dog walker. She has stayed in my home (mole) for a couple of weeks and has had no problems with my three dogs, 2 male Staff/Staff X and one female Staff. She can initially be grumbly when meeting some strange dogs close up, whilst she is on lead, but we are working on this. She is also stressed when taken into a strange house to be viewed by prospective adopters. Anyone wanting to see her with a view to adoption would have to be prepared to be patient with her for the first few days and allow her time to settle down. She doesn’t really do anything wrong but is just generally anxious and unsettled. This can be helped by using a cage where she will feel calm. She will need good quality free running exercise a couple of times a day. Nita is spayed, vaccinated, wormed, flead and microchipped. 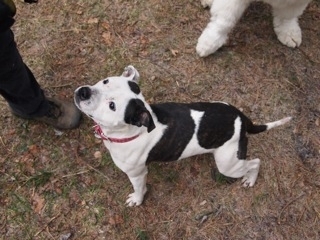 Re: Nita fostered Staffie girl looking for her forever home. What type of dog owns the giant paws in that bottom pic??? minniemoo wrote: What type of dog owns the giant paws in that bottom pic??? Not really sure ... could be an Old English Sheepdog as Rachel walks one of those.